WE ARE AT CAPACITY FOR PUPPIES RIGHT NOW. WE WILL ONLY BE CONSIDERING PUPPIES THAT ARE OVER 6 MONTHS OLD. WE WILL ALSO BE TAKING NEW CUSTOMERS ON A CASE BY CASE BECAUSE WE ARE SO BUSY. Weekdays are extremely busy for daycare at Ohana! When we have a full house, we may have more play groups to rotate. So if your dog usually comes home from daycare exhausted, they may not be as tired some days because of this. If you are considering to start daycare with us, please note that when really busy, it can get very loud too. It can be a bit overwhelming for some dogs. We wanted to be upfront with our existing customers, as well as anyone who may be considering us, so that all dogs have the best experience they can. Please note that all dogs must be 16 weeks old and have at least their 2nd series of shots, including the flu vaccine. Thank you for your understanding. This is our smaller play yard, usually reserved for small dogs and big, but gentle dogs who may not enjoy play time with other big dogs. 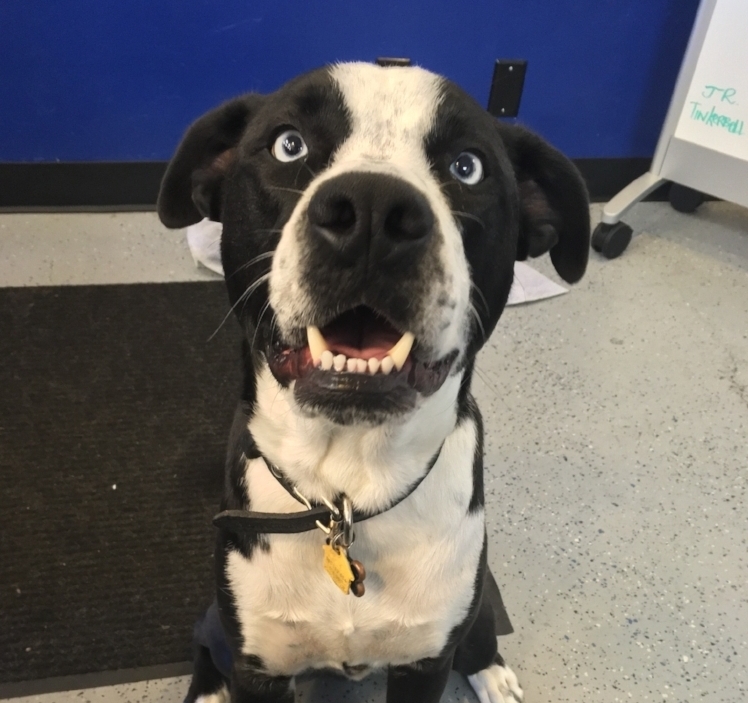 Our daycare service is a great way for your dog to socialize, as well as burn off that extra energy so you can bring home a worn out, but very happy pup. Daycare is done on a walk-in basis, so no need to make reservations. Just drop your dog off on your way to work, and be in and out and on your way. WE DO NOT HAVE DAYCARE SERVICE ON HOLIDAYS OR DURING ANY BIG HOLIDAY WEEKEND.If you are looking to drop-off for daycare within 2 or 3 days before and after a holiday, please cHECK and make sure we are still accepting dogs for daycare, as we may be at capacity. We have two different size indoor play yards to accommodate for all size dogs. Our small dog play yard is about 25' x 20' while our big dog play yard is about 50' x 20'. Both of our play yards include a variety of balls, bones, and other toys, as well as beds for the dogs to take a break from playtime. The floors of our play yards are covered with 3/8" thick, sealed, rubber flooring. They are made for dogs to run and play on and are much better than concrete floors. While on the play yards, your dog will be supervised by our staff who will provide constant entertainment for the pups. This assures that we can provide the safest play environment for your dog, and prevent scuffles and injuries. This is our big play yard, mainly for big dog play time, It's very spacious and allows them to really get their energy out! If your dog isn't social with other dogs, or even with humans, fear not, we can accommodate for them as well. While they may not be social with humans, they do have to be non-aggressive. We have to be able to either put a lead around their neck or be able to grab their collar, without any act of aggression towards us. We also have an outdoor play yard where your special needs pup can have solo play time. Also, we offer a secluded room inside for senior, blind, injured, or other special needs dogs to stay if they can't handle being in a run near the other dogs. We always have a variety of dogs hanging out in the office as well! This room behind the office is also where our small dogs sleep when boarding. Food, water and bedding are set up in a crate for each guest. Dogs from the same family can sleep together if requested. In order to determine if our daycare service is right for your dog, we will provide a free half day of daycare (up to 4 hours, on weekdays only) in which we will observe how your dog plays with others, as well as our staff. In the event that your dog is not doing well in the social groups, we have a solo playtime yard where your dog can receive more intimate attention. Evaluations are not necessary for boarding but we do have to be able to either put a lead around their neck, or be able to grab their collar, without any act of aggression towards us. All dogs are evaluated the day they arrive to board. We never just put dogs in a play group as soon as they arrive. Observing them when they first get here allows us to place them in the proper play group with the other guests staying at the same time. You can always bring your dog in for a couple hours once or twice before they stay. Daycare packages can be split into half-days as well.